Do you know what to do during and following a disaster or family emergency? What if you only have 5 minutes to leave your home? What will you take? Where will you go? A Firefighter and Paramedic of almost 25 years Justin Schorr has been with families on their worst days and following large scale incidents. as a result he created a custom family disaster plan for his own family and put it to the test when one of his daughters was suddenly ill and in the emergency room...and his phone died...and his wife was on a plane. He emailed his out of town contact and activated the plan. Minutes later friends and family were mobilizing to help. When disaster strikes your family needs to be ready. In conjunction with The Motorcop Mindset creator Jason Hoschouer and the What's Your Emergency Podcast comes a custom built, online, self paced course that will end with your family having a robust, tested Family Disaster Plan. We'll even throw in a few tips and tricks to make your home and workplace safer. 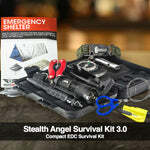 Are you here for the Stealth Angel Survival Kit 1.0 Giveaway? Just sign up below before noon on the 24th and you'll be entered to win! Browse other Stealth Angel gear below! and a chance to test the course before it goes live!